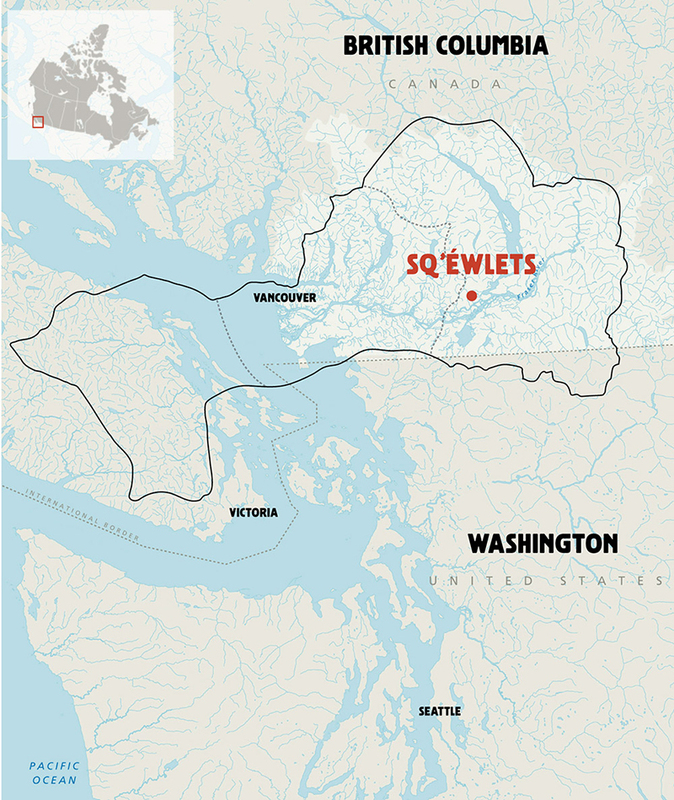 Sq’éwlets: A Stó:lo-Coast Salish Community in the Fraser River Valley (http://digitalsqewlets.ca/) is an online exhibit produced by the Sq’éwlets First Nation and the Stó:lo Research and Resource Management Centre. Funded by the Virtual Museum of Canada, the project was collaboratively produced between 2013 and 2017 by intergenerational community members, archaeologists, media producers, exhibition designers, and museum anthropologists. Digital Sq’éwlets is at once a virtual exhibit, a documentary film project, a Halq’eméylem language tool, a photo-essay, a teaching resource, and a series of physical exhibitions inspired by the digital exhibit. In this paper, we dig into the long-term collaborative relationships that were formed in the process of conducting community-based archaeological work at Qithyil, which included the development of cultural protocols for excavating and re-burying ancestral human remains. We then directly connect these relationships to developments in new digital collections networks, such as the Reciprocal Research Network, which was co-developed by four British Columbia First Nations. We show in this paper how the very principles and protocols for conducting archaeology at Qithyil informed and guided the new media based production of the Sq’éwlets online exhibit and related physical exhibitions. We argue that, in a recursive mode, our collaborative media production, influenced by innovative long-term community-based archaeological practice at Qithyil, signals the potential of digital heritage projects to intervene in conventional museum and curatorial practices. Our Old People tell us we have always been here, in S’ólh Téméxw, Our Land. As Stó:lō, we are People of the River, the Fraser River. We are also Xwélmexw, People of the Land. We are a nation of tribes joined together by our families, the land and the rivers. 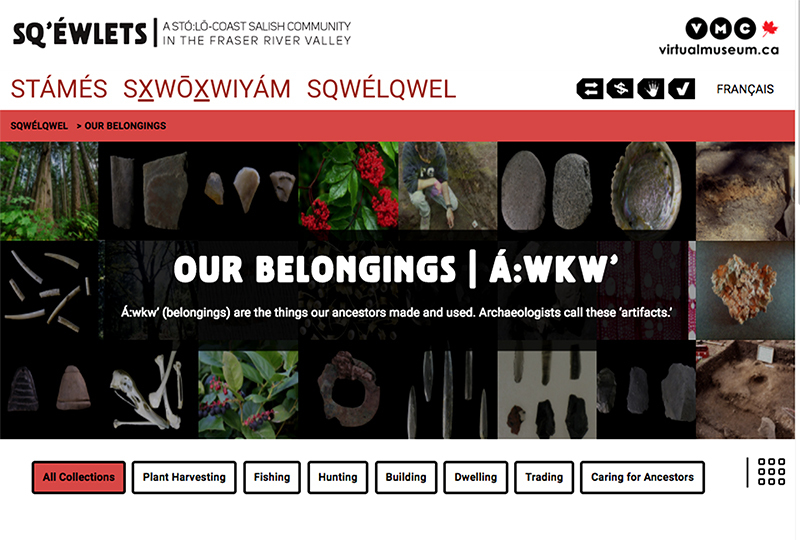 Sq’éwlets: A Stó:lō-Coast Salish Community in the Fraser River Valley (http://digitalsqewlets.ca/ ) is an online exhibit produced by the Sq’éwlets community and the Stó:lo Research and Resource Management Centre. Funded by the Virtual Museum of Canada, the project was created between 2013 and 2017 by intergenerational community members, archaeologists, media producers, exhibition designers, and museum anthropologists (see the full list of credits at http://digitalsqewlets.ca/credits-eng.php). The authors of this paper are the Co-Producers (Schaepe, Lyons, Hennessy, Blake), with Sq’éwlets leadership, Chief Andy Phillips and Stó:lō Grand Chief Clarence Pennier, and project documentarians (Muntean and Kadir). The exhibit was initiated with the intention of sharing documentation of over 20 years of collaborative community-based archaeology at a site known as Qithyil (known more colloquially as the Scowlitz site) at the confluence of the Harrison and Fraser Rivers in southwest British Columbia, where Sq’éwlets people have made their home since time immemorial. In the course of production, the online project developed into a portrait of contemporary Sq’éwlets life and resilience in the face of ongoing colonialism. Digital Sq’éwlets is at once a virtual exhibit, a documentary film project, a Halq’eméylem language tool, a photo-essay, a set of classroom resources, and a series of physical exhibitions inspired by the digital exhibit. In this paper, we highlight elements of the long-term relationships that were formed in the process of conducting community-based archaeological work at Qithyil, which included the development of cultural protocols for excavating and re-burying ancestral human remains. We give some examples of how the very principles and protocols for conducting archaeology at Qithyil informed and guided the new media-based production and digital curation of the Sq’éwlets online exhibit. We then connect these relationships to developments in new digital collections networks that made this virtual project possible. 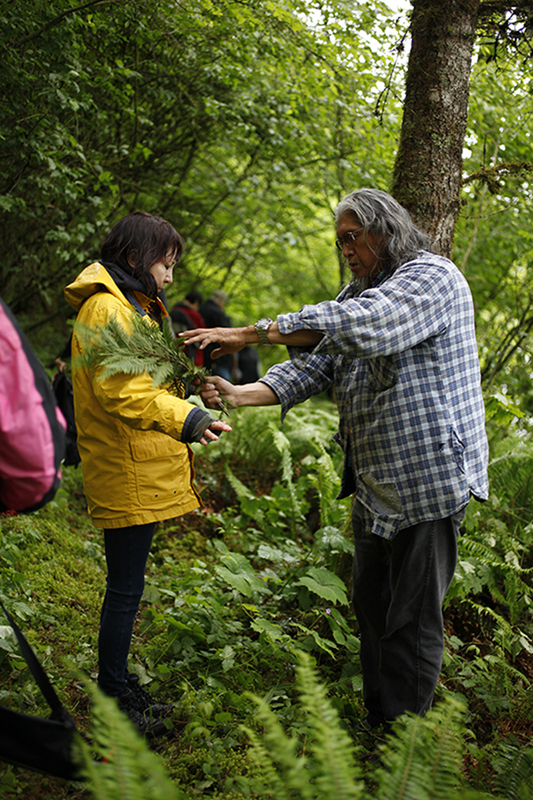 Referencing Kelty’s (2008) notion of “recursive publics,” we discuss how the Reciprocal Research Network (Rowley, 2013), which was used in this project to curate belongings (know as “artifacts” by archaeologists), was built by the actors that have the greatest stake in producing and maintaining it—Northwest Coast First Nations, and the museums that steward their cultural property. As this project demonstrates, these networks are creating new possibilities for associations and interactions between researchers, Indigenous communities, and museums, while demonstrating the complexities of such work and the necessity of long term collaboration. How are these sociotechnical systems dependent on the creation of relationships, and, how are those relationships enacted? If the creation of new media for museums is to take culture seriously (Balsamo, 2011) in design and methods of production, how might museum media be shaped by, or actively re-shape, the discourses and related practices that maintain them? As Crystal Fraser and Zoe Todd point out, the structures and policies that govern the organization of and access to colonial museums and archives have amplified Eurocentric perspectives that continue to support policies of dispossession and violence. They argue that it is “essential that we continue to recognize archival spaces, especially state archives, for their original intent: to create national narratives that seek to legitimize the nation state by excluding Indigenous voices, bodies, economies, histories, and socio-political structures” (Fraser & Todd, 2016, 71-72). Given this context, can new digital collections networks and emerging documentary technologies used by memory institutions (galleries, libraries, archives, museums) move beyond “neo-colonial collaboration” (Boast, 2011) toward transformative instances of reconciliation? In a recursive mode, our collaborative media production, influenced by community-based archaeology at Qithyil, and the virtual project’s manifestation as physical exhibitions in a series of museums and galleries on unceded Stó:lo territory (Reach Gallery Museum, Abbotsford B.C., the Chilliwack Museum and Archives, Chilliwack B.C, and the Sq’éwlets Band Hall) signal the potential of digital projects to intervene in conventional museum and curatorial practice. These protocols came to include guidance on the excavation of ancestor mounds (burial mounds to archaeologists) by Sq’éwlets spiritual advisors like Vince Stogan and Kenny Moses; the use of tumuth (or red ochre) on wrists and temples, to make people visible to spirits on the site; and the use of “burnings” on site to feed the ancestors who once lived at Qithyil by providing a feast for them (see the short project documentary The Development of Community Based Archaeology at Qithyil https://vimeo.com/141120263 ). After a decade of excavations, more than 6000 belongings were being archived at three repositories—Simon Fraser University, the University of British Columbia, and Stó:lō Nation. As Chief Andy Phillips expressed to the project team (Lyons et. al., 2017), it had long been the community’s goal to bring this collection back together in a way that would allow Sq’éwlets youth to better connect with their histories and identities. He also emphasized the importance of the Sq’éwlets community sharing their perspectives and histories with a broader audience, in the spirit of building greater understanding. With project partners David Schaepe (Stó:lō Research and Resource Management Centre), John Welch (Sovereignty and Heritage Project, Simon Fraser University), and Dana Lepofsky (Simon Fraser University), the idea was forwarded to begin this work by consolidating the Qithyil belongings using the Reciprocal Research Network (RRN), a digital collections network that facilitates digital access to Northwest Coast Collections and collaborative curatorial research between international partner holding institutions. Over the course of two years, we worked to support a process by which belongings from all of these repositories could be photographed, catalogued, and united in a single portal through the Reciprocal Research Network. This was a starting point for the subsequent funding application and development of the Sq’éwlets Virtual Museum of Canada project at the heart of this paper. In the next section of the paper, we explain why the use of the Reciprocal Research Network is significant, and how this work builds on our past work with the RRN and the remediation of digital collections by originating communities. The Reciprocal Research Network was launched in 2010 as a part of the Museum of Anthropology (MOA) at the University of British Columbia’s physical and digital restructuring of the museum and its collections storage, entitled “A Partnership of Peoples” (Rowley et al., 2010). 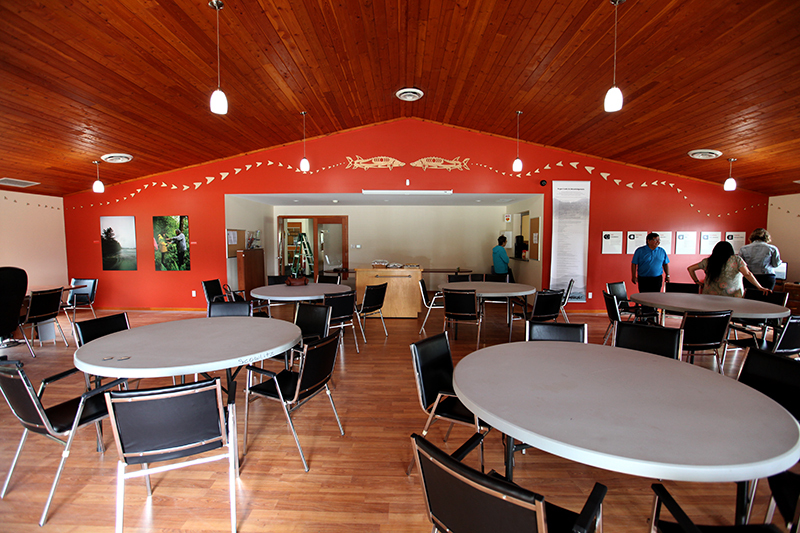 It was co-developed by MOA with the Musqueam Indian Band, the U’mista Cultural Society, and the Stó:lō Nation/Stó:lō Tribal Council, which included several years of design and consultation with community members. At the time of writing this paper, the RRN lists access to over 500,400 objects coming from twenty-seven holding institutions, including the First Nations’ co-developers (RRN, 2018). These digital object records are available to registered users through a faceted search interface, and also provide collaborative digital curatorial and writing spaces with customizable levels of privacy within the password protected system (Rowley et al., 2010). 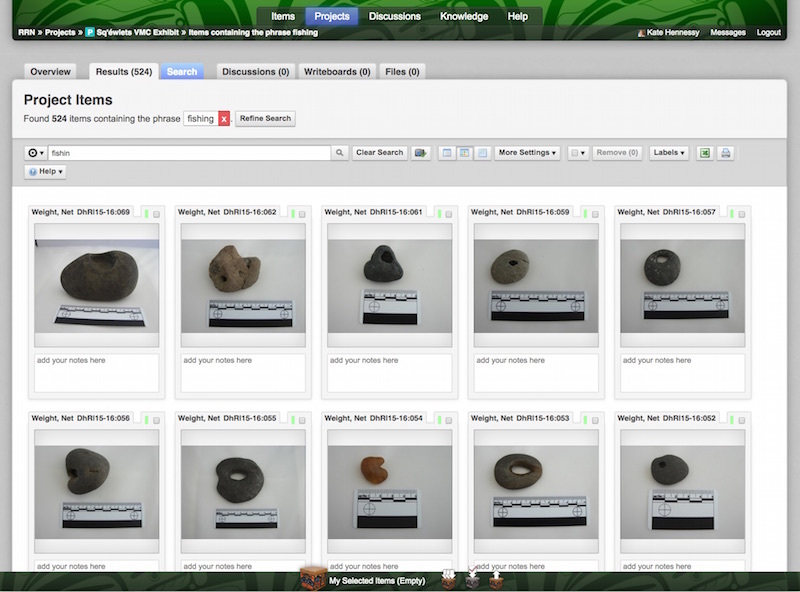 In Hennessy and Lyons’ earlier work with the Inuvialuit Cultural Resource Centre and the Smithsonian’s National Museum of Natural History, we used the RRN to remediate the Inuvialuit MacFarlane Collection so that the collection could be read through an Inuvialuit lens and in the context of community engagement with the collection (Hennessy et al., 2012). The final project, the “Inuvialuit Pitqusiit Inuuniarutait: Inuvialuit Living History Project” (http://www.inuvialuitlivinghistory.ca/ ), is a virtual exhibit and community online archive that continues to promote local engagement with the collection, even though the physical belongings remain in storage in the Smithsonian’s Museum Support Center in Maryland. In this case, the design of the RRN’s API in particular played a role generating an accessible tool for recontextualizing these collections (Hennessy et. al., 2012). At both the MOA and Musqueam openings, community leader and former Chief Wendy Grant-John told the crowd that she had always distrusted museums. To her and her community, they had been extractive institutions. Now, she said, because of “the experience and relationship that we’ve built with the museums,” the community appreciates the work that museums have tried to do. Longtime band councillor Howard E. Grant specifically applauded the work of former MOA Director Michael Ames and other current and former museum staff who have driven museums to “change their mindset.” Projects like these solidify, as Grant-John put it, “the commitment that all of those museums have made to ensuring that we are at this place of working together now” (Marsh, 2015, 177). We view the RRN and the collaborative tools it provides as both emerging from and supporting broader movements in museums and other memory institutions to create digital tools that promote and support greater transparency and collaborative processes, while respecting the particular cultural protocols for respectful circulation of knowledge. The RRN and other digital museum networks have emerged in a context of critical reevaluation of the role of museums and archives in Canadian society. In 1992, the Canadian Museums Association and the Assembly of First Nations co-sponsored the Task Force Report on Museums and First Peoples, with the mission of developing “an ethical framework and strategies for Aboriginal Nations to represent their history and culture in concert with cultural institutions” (AFN and CMA, 1992). Museum scholar and art historian Ruth Phillips (2011) describes how in the early 1990s, digital imaging, database, and search technologies were rapidly advancing at the same time that Canadian museums were looking for new ways to implement models of partnership and collaboration mandated in the Task Force Report. Phillips asserts that new technologies provide unprecedented new tools for both reassembling and creating new forms of access to dispersed collections of Indigenous cultural objects. In the context of collaborative museology, she writes, “remote access can begin to level the playing field by displacing the museum as the unique site for the study of these materials and mediating entrenched hierarchies of privileged access and complicated protocols of permission, vetting, and security” (Phillips, 2011). More recently, the Canadian Truth and Reconciliation Commission (TRC) (2015), the mandate of which is to inform Canadians of the history and legacy of what happened in Indian Residential schools in Canada, specifically called libraries, archives, and museums to act in redressing the legacy of residential schools and participate in the ongoing process of reconciliation by reviewing museum policies and determining the level of compliance with the United Nations Declaration on the Rights of Indigenous Peoples (2008). From this perspective, museums, archives, and libraries play a central role in supporting and advancing human rights, the rights of Indigenous peoples specifically, and in creating access to cultural histories and cultural property by creating social and technical relationships in which oppressive structures can be challenged. Where memory institutions have largely functioned to exclude Indigenous voice and histories (Fraser & Todd, 2016), our project team has attempted to mobilize new digital networks like the RRN to generate collaborative working relationships and related digital spaces in which Indigenous languages, cultural histories, traditional economies, and contemporary cultural expressions that are continuous with past cultural expressions are foregrounded. Wary of an important critique framing such digital projects as “neocolonial collaboration” (Boast, 2011), and the critique of what has come to be known as “virtual repatriation” (Boast & Enote, 2013), projects like the RRN, GRASAC (the Great Lakes Alliance for the Study of Aboriginal Arts and Culture) (GRASAC, 2018), The Mukurtu Content Management System and Plateau Peoples’ Portal (Christen, 2015), and the Cambridge Museum of Archaeology and Anthropology’s collaboration with the A:shiwi A:wan Museum and Heritage Centre, representing the Zuni Nation (Srinivasan et al., 2010) are engaging members of originating communities in processes of relationship building and network development that aim to enhance possibilities for association, access, and connection. We see parallels in the way these digital collections networks bring concerned communities together in a process of collaborative design with Chris Kelty’s notion of “recursive publics,” which he describes in Two Bits: The Cultural Significance of Free Software (2008). Kelty presents an ethnography of “geeks” brought together as a group through participation in the development and protection of the Internet. He argues that they are an example of “recursive publics,” or “a public constituted through a shared sense of concern for the technical and legal conditions of possibility of their own association” (2008, 192). These “recursive publics” are essentially both creating the conditions of their association, and playing an active role in maintaining those conditions. The Reciprocal Research Network, for example, was co-developed and maintained by the actors that have the greatest stake in producing and maintaining them—a group of Northwest Coast First Nations, and the museums that steward their cultural property. As we show in our work with the Inuvialuit Cultural Resource Centre, and now with the Sq’éwlets community, the RRN is creating new possibilities for association between Indigenous organizations, museums, researchers, and diverse publics. We view the RRN and other digital networks as creating recursive publics by: 1) creating sociotechnical conditions that facilitate greater access by First Nations to their cultural heritage in museum collections; 2) innovating sociotechnical strategies (eg. API and other software toolkits, collaborative curatorial tools) aimed at increasing the involvement of Indigenous peoples in the interpretation and representation of their culture and history by cultural institutions and in their own communities; and 3) building relationships predicated on bringing Indigenous and museum partners together to collectively design the terms of their own association. We are interested here and in future work to explore the possibility that these recursive publics may be shifting museum practices more broadly, including the increased prevalence of Indigenous and collaborative community curation and the repatriation of cultural property. In the remainder of the paper, we will focus on the Sq’éwlets Virtual Museum of Canada exhibit as an example of a remediation of digitized archaeological collections within the context of Sq’éwlets cultural knowledge and histories. It is also an example of a long term collaborative relationship guiding the design of a new digital representation of culture, history, and belongings. In a recursive mode, this long-standing relationship, which included the Stó:lō Nation/Stó:lō Tribal Council’s co-development of the RRN and our use of the RRN to curate belongings for our exhibit, created a context for our collaboration. In these ways, new possibilities for dialogue and self-representation—setting the terms of association—could be created. How are these sociotechnical systems dependent on the creation of relationships, and, how are those relationships enacted? 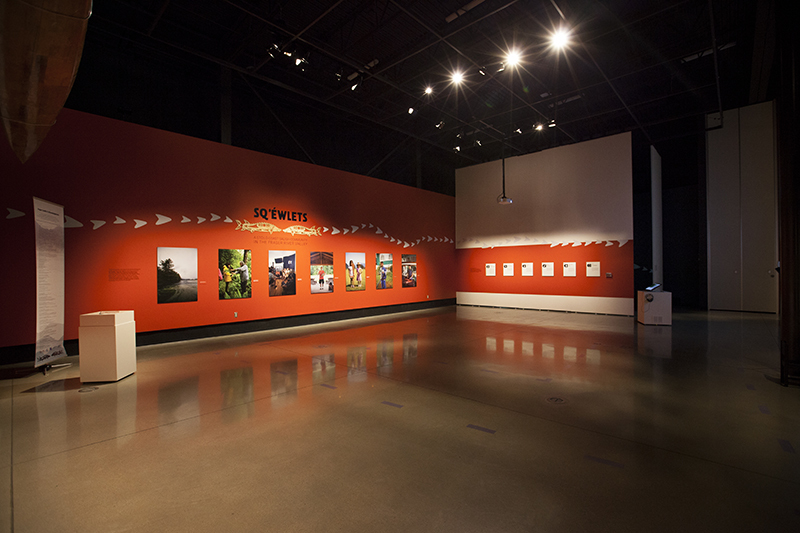 In 2014, in the initial planning stages of our Virtual Museum of Canada exhibition, Sq’éwlets leadership and community Elders gathered at the Stó:lō Research and Resource Management Centre (SRRMC) in Chilliwack, BC, to discuss and begin to define the central themes of the virtual exhibit. Dave Schaepe, Director of SRRMC, recorded discussion notes on a SMART Board as the conversation progressed. Building on the long relationship developed between the Sq’éwlets community, Stó:lō Nation, the University of British Columbia and Simon Fraser University in the course of archaeological work at the ancestral site Qithyil, people gathered for the meeting highlighted themes such as prioritizing and mobilizing Halq’emeylem language; strengthening relationships between Elders and youth; teaching about Sq’éwlets Swoxwyiam (origin stories) and Sqwelqwel (oral histories) and recording these with people of all ages; the importance of Sq’éwlets spiritual practices; and the directive to “put it all together,” or, bringing knowledge of all kinds into one digital space. The goal of telling the outside world who Sq’éwlets people are was articulated, as was the mapping and use of Sq’éwlets place names. 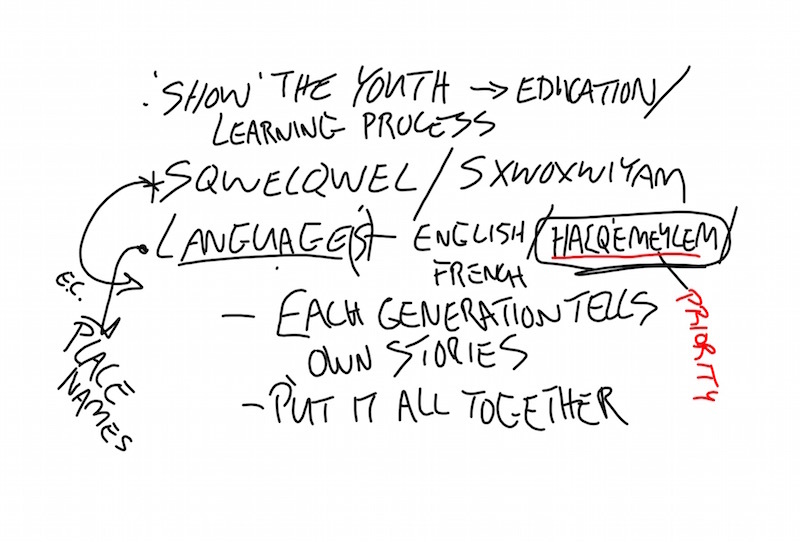 These early notes were used to guide how the digital project would unfold, how members of the project team would interact, and how the Sq’éwlets community would represent itself publicly online. These guidelines suggested a process of production as much as specific exhibition content. Building on prior tangible computing design work with the Museum of Anthropology at UBC on the Musqueam exhibition c̓əsnaʔəm the city before the city (Muntean et al., 2016, 2017), and virtual exhibit design with the Doig River First Nation on Dane Wajich: Dane-zaa Stories and Songs—Dreamers and the Land (2007) (see Hennessy 2012), our project team aimed to create a respectful space in which an open process of content development could take place (and see Lyons 2011, Lyons et al. 2016). While we see some parallels with work being conducted in the area of Value Sensitive Design, which has evolved from examining how intentionally or unintentionally embedded values affect the users of a digital system (Friedman, 1996; Friedman & Kahn, 2002; Le Dantec et al., 2009) to numerous methods that can be incorporated into a Value Sensitive Design process (Friedman et al., 2017), it was our project’s grounding in a long collaborative relationship that led to the primacy of Sq’éwlets knowledge and voices in the design and content of the online exhibition. In this section, we highlight some examples of how initial goals articulated for the project came to be realized in our online exhibit. Building on cultural protocols established in prior archaeological collaborations, we negotiated cultural representation, the importance of language, contemporary questions of intellectual property, and the digital circulation of cultural knowledge and belongings. This collaborative work and the relationships that supported it are expressed in the content of the online exhibit. Sq’éwlets worldview is represented in the Halq’eméylem-language organization of the exhibit. 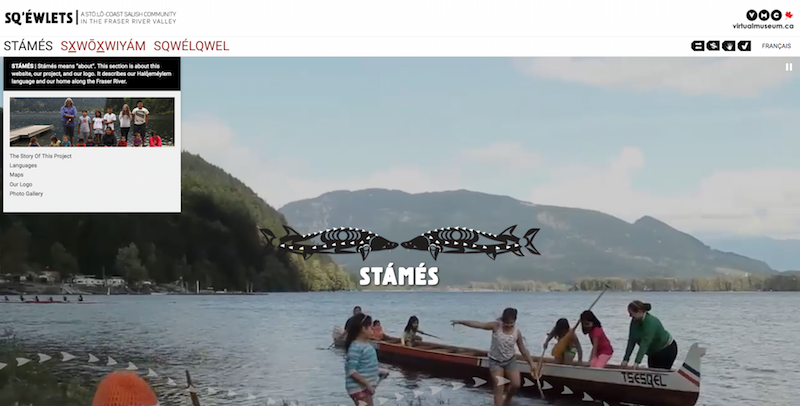 Stó:lō concepts form the anchors of the website; Sxwoxwiya´m are the origin stories of the Sq’éwlets; Sqwelqwel are their more recent knowledge and history; and Stámés is about the project describes its inception and cultural context. Halq’eméylem language resources include a key to the Stó:lō writing system, a glossary including audio for all Halq’eméylem terms used on the website, including place names in the maps. Spiritual health and wellness of the project team and participants was an essential part of our group process. For instance, while visiting the Qithyil site, we wore tumuth at our temples in order to be seen by the ancestors and were brushed off with red cedar as we left the site. 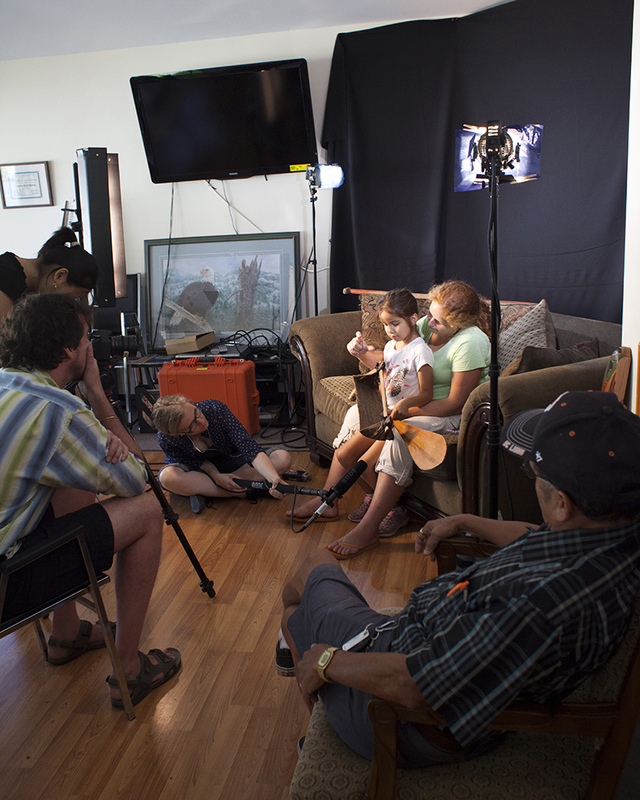 The cultural protocols that guided our work are described in one of the mini-documentaries presented in the Our Voices section of or website, at http://www.digitalsqewlets.ca/sqwelqwel/voices-voix/video/doc-protocols-eng.php. Á:kwk’, or belongings, are the things made and used by Stó:lō ancestors. We used this term in preference to “artifacts” to show the relationship between makers, users, and today’s descendants who have a cultural responsibility for their care and curation (Lyons et al., 2016; Muntean et al., 2015; Wilson, 2015). We organized the Belongings section of the website around traditional activities: plant harvesting, fishing, hunting, building, dwelling, trading, and caring for ancestors. The Traditional Knowledge labels are tools used to help site users understand the cultural knowledge presented and know how to use, cite, and share this knowledge in a culturally appropriate way (Anderson & Christen, 2013). Developed by Jane Anderson and Kimberly Christen Withey (2013), the aim of the labels is to “provide a practical method to deal with the range of intellectual property issues that arise in relation to managing cultural heritage materials [by] offer[ing] Indigenous stakeholders the tools to add cultural and historical context to their cultural heritage content” (localcontexts.org). 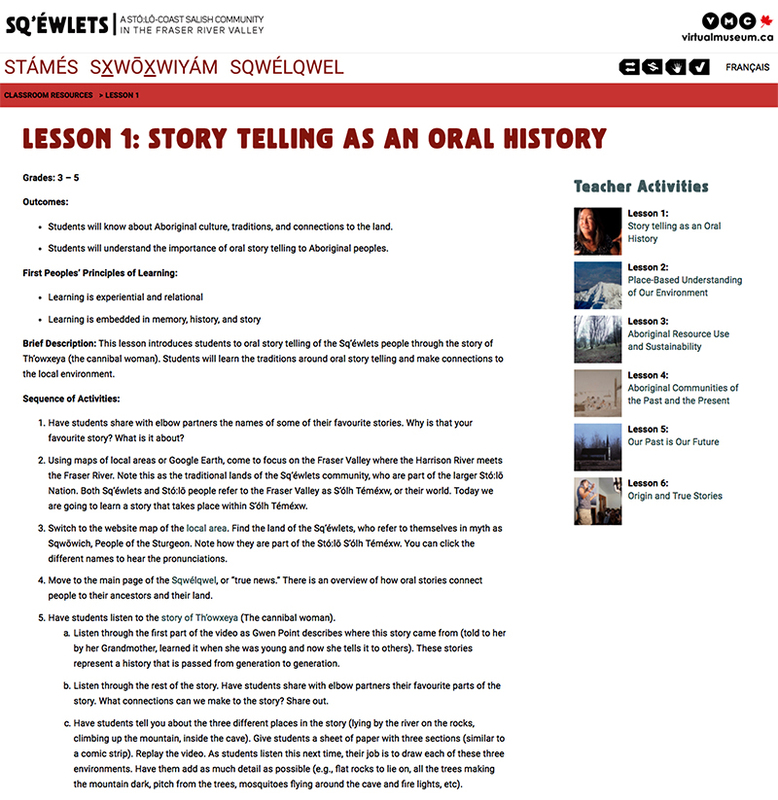 Examples developed by Sq’éwlets members include eweta xwóxweyem, literally “no selling,” asking users to respect the non-commercial orientation of the knowledge on the website; iyólem syó:ys, or “verified,” confirming that the knowledge presented was vetted appropriately by the community; and “xa:xa,” meaning secret or sacred and indicating that there are certain aspects of a subject that cannot be shared on the website, such as the depiction of human remains. The Classroom Resources include an introduction to the website for teachers and six lesson plans for children from Grades three to eight that introduce children to oral traditions, place-based knowledge, Aboriginal resource use and sustainability, and other cultural themes. These resources are aligned with the First Peoples’ Principles of Learning as established by the First Nation Education Steering Committee (FNESC) in British Columbia (BC). 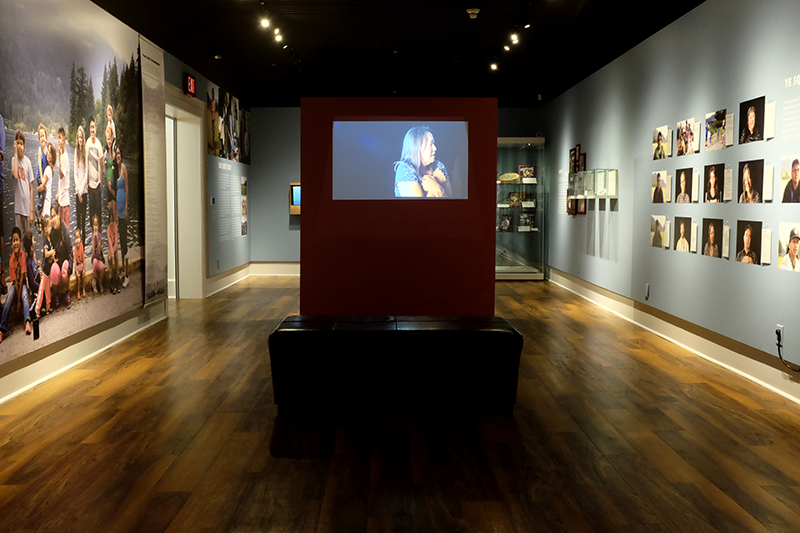 As we worked towards the official launch of the online exhibit in January 2017, our project team was invited by director and curator Laura Schneider to co-curate an exhibition at the Reach Gallery Museum in Abbotsford, British Columbia—on unceded Stó:lō-Coast Salish territory—to reinterpret and celebrate the virtual exhibition launch in a gallery setting. We subsequently re-developed the exhibition for installation at the Chilliwack Museum & Archives with director Matthew Francis, which opened in December, 2017. Finally, with the de-installation of the Reach exhibition in August 2017, we reinterpreted the exhibition again for a permanent installation at the Sq’éwlets Band Hall. All three of these exhibitions represented an unprecedented level of curatorial collaboration with members of the Stó:lō and Sq’éwlets communities and the installation of exhibitions that foregrounded Stó:lō and Sq’éwlets voice in the presentation of their histories and contemporary identities, both within and external to the Sq’éwlets community. In all three physical exhibitions, visitors were prompted to access the online exhibit on phones and home computers to continue to access content after leaving the gallery spaces. At the Reach Gallery Museum, the online exhibit’s deep content was used as a starting point for the curation of the gallery space. Video documentaries, which were the product of community-based youth and Elder workshops, were presented in a comfortable viewing space. A photo-essay highlighting the project’s production process—themes of Elders and youth, continuity of cultural practice, and the centrality of the Qithyil ancestral site—were curated from the project archive and prominently installed along with a racing canoe that belongs to and is actively used by Makenzie Chapman, one of the project’s youth participants. Photographs showing the history of collaborative archaeological work at Qithyil, along with early planning documents and storyboards for the virtual exhibit were displayed along with an introduction to the exhibition. Traditional Knowledge (TK) labels created and defined by Sq’éwlets members were prominently featured as an expression of Sq’éwlets ownership and control of cultural knowledge and belongings. Central design elements—the sturgeon logo designed by Alicia Point, and the sturgeon scale motif that is used throughout the site—found new expression in laser-cut plywood and vinyl. Public programming throughout the exhibition’s duration in the gallery brought school children and members of the public into close conversation with exhibition content and the first-person storytelling of Sq’éwlets community members and collaborating archaeologists. At the Chilliwack Museum & Archives, the Halq’eme´ylem language and the voices of project team members were presented as primary exhibition content. This included a screening space for video documentaries and hands-on interactive spaces for children’s engagement with Sq’éwlets Halq’eme´ylem exhibition themes. Representation of contemporary Stó:lō and Sq’éwlets community members and the continuity of knowledge were presented as key themes, with the virtual exhibit available on a screen in the exhibition space for deeper engagement with content. At the Sq’éwlets Band Hall, the project team reinterpreted exhibition materials from the Reach Gallery Museum for a permanent installation in the community’s main gathering space, where much of the work to develop the exhibitions took place. Photographs representing the production process, TK labels and their Sq’éwlets definitions, the plywood sturgeon motif, and a new access kiosk for the virtual exhibit marked a full circle return of the project to Sq’éwlets. Our process of developing these physical exhibitions signalled, for our project team, the potential of digital heritage projects to intervene in conventional museum and curatorial practice. In these cases, the collaborative context of long-term research and more recent digital curation shaped the way Sq’éwlets voices and histories were shared with the general public both online and in museums on unceded Stó:lō territory. We gratefully thank Sq’éwlets leadership (authors Clarence Pennier and Andy Phillips, and Colin Pennier), Sq’éwlets members Betty Charlie, Clifford Hall, Lucille Hall, Glenn Hall, Vi Pennier, Reg Phillips, John Williams Sr, Sonny Williams, Joey Chapman, Allan Williams, Melanie TenBos, Allan Williams, Tillie Chapman, Rita Leon, Maybel Point, Atawni Hall, Duran Hall, Cecilia Chapman, MaryAnn Hall, Darlene Williams, Nancy Pennier, Katina Pennier, Fran Charlie, Ken Caouette, Monica Caouette, Anita Hall, Nessa Terry, Jaysun Williams, Craig Hare, Jacqueline Fairclough, Stephanie Pennier, and Judith Kelly. We also extend warm thanks to Alicia Point, Gwen Point, Rachel Ward, Alix Shield, Irine Prastio, Sophie McCall, Doug Brown, Dana Lepofsky, Strang Burton, Sheryl MacMath, Sonny McHalsie, Jared Deck, Tia Halstad, Rachel Anderson, Tracey Joe, Bear Image Productions, Sue Formosa, Patricia Ormerod, Mariko Adams, Ashley Vandepol, Sue Rowley, Keith Carlson, John Lutz, Kim Christen, Jane Anderson, Brian Thom, Nicole Oakes and Sandra Johansen. We gratefully acknowledge our funders, including the Virtual Museum of Canada at the Canadian Museum of History and our Project Officer Brigitte Beaulne-Syp; the Intellectual Property in Cultural Heritage Project, Director George Nicholas and the IPinCH Steering Committee; and the Simon Fraser University Community Engagement Fund. Our sincere thanks to Laura Schneider and Kate Bradford (Reach Gallery Museum), and Matthew Francis and Adrienne Rempel (Chilliwack Museum and Archives). Anderson, J. & K. Christen. (2013). “Chuck a copyright on it: Dilemmas of digital return and the possibilities for traditional knowledge licenses and labels.” Museum Anthropology Review 7(1–2), 105126. Balsamo, A. (2011). Designing culture: the technological imagination at work. Durham and London: Duke University Press. Blake, M. (2004). “Fraser Valley Trade and Prestige as Seen from Scowlitz. Complex Hunter-Gatherers. Evolution and Organization of Prehistoric Communities on the Plateau of Northwestern North America.” In W. Prentiss and Kuijt, I. (ed.). Anthropology of Pacific North America Series. Salt Lake: University of Utah Press, 103-12. Blake, M., G. Coupland, & B. Thom. (1993) “Dating the Scowlitz Site.” The Midden 25(1), 7-9. Boas, F. (2002) Indian Myths and Legends from the North Pacific Coast of America: Legends from the Lower Fraser River. A translation of Franz Boas’ 1895 edition of Indianische Sagen von der Nord-Pacifischen Küste Amerikas. Vancouver: Talon Books. Boast R. (2011). “Neocolonial Collaboration: Museum as Contact Zone Revisited.” Museum Anthropology 34(1), 56–70. Brown, D. R., and D. Lepofsky (2008). “Ancient Ground Stone Celt Production and Exchange in the Fraser Valley and Strait of Georgia, southwestern British Columbia.” Unpublished poster, 73rd Annual Meeting of the Society for American Archaeology, Vancouver. Carlson, K. (ed). (1997). You Are Asked To Witness: The Stó:lô In Canada’s Pacific Coast History. Chilliwack: Stó:lô Heritage Trust. Carlson, K., A.J. McHalsie. (2001). A Stó:lô-Coast Salish Historical Atlas. Vancouver, Seattle and Chilliwack: Douglas and McIntyre, University of Washington Press and Stó:lô Heritage Trust. Christen, K. (2015). “Tribal Archives, Traditional Knowledge and Local Contexts: Why the ‘s’ Matters.” Journal of Western Archives 6(1), 1-19. Friedman, B. (1996). “Value-sensitive design.” Interactions 3(6), 16–23. Friedman, B., D. G. Hendry, A. Borning (2017). “A Survey of Value Sensitive Design Methods.” Foundations and Trends in Human–Computer Interaction, 11(2), 63–125. Hennessy, K. (2012) “Cultural Heritage on the Web: Applied Digital Visual Anthropology and Local Cultural Property Rights Discourse.” International Journal of Cultural Property 19, 345-69. Hennessy, K., N. Lyons, M. Joe, S. Loring, & C. Arnold (2013). “The Inuvialuit Living History Project: Digital Return as the Forging of Relationships between Institutions, People, and Data.” Museum Anthropology Review 7(1-2), 44-73. Kelty, C. (2008) Two Bits: The Cultural Significance of Free Software. London and Durham: Duke University Press. Lepofsky D, M. Blake, D. Brown, et. al. (2000) “The Archaeology of the Scowlitz Site, Southwestern British Columbia.” Journal of Field Archaeology 27(4), 391–416. Lepofsky, D. & N. Lyons (2003). “Modeling ancient plant use on the Northwest Coast: Towards an understanding of mobility and sedentism.” Journal of Archaeological Science 30, 1357–71. Lyons, N. (2000). “Investigating ancient socioeconomy in Sto:lo Territory: A palaeoethnobotanical analysis of the Scowlitz site, Southwestern British Columbia.” Unpublished Master’s Thesis, Department of Archaeology, Simon Fraser University, Burnaby. Lyons N. (2011). “Creating space for negotiating the nature and outcomes of collaborative research projects with Aboriginal communities.” Inuit Studies 35(1–2), 83–105. Lyons, N., D. Schaepe, K. Hennessy, M. Blake, C. Pennier, J.R. Welch, K. McIntosh, A. Phillips, B. Charlie, C. Hall, L. Hall, A. Kadir, A. Point, V. Pennier, R. Phillips, R. Muntean, J. Williams, Jr., J. Williams, Sr., J. Chapman, C, Pennier. (2016). “Sharing Deep History as Digital Knowledge: An Ontology of the Sq’éwlets Website Project.” Journal of Social Archaeology, Fall 2016 (DOI: 10.1177/1469605316668451), 26 pages. Marsh, D. (2015). “c̓əsnaʔəm, the city before the city. Exhibits at the Museum of Vancouver, the Musqueam Cultural Education Resource Center, and the University of British Columbia Museum of Anthropology, Vancouver, Canada. January 21, 23, and 25, 2015 to present.” Museum Anthropology 38(2),170-78. Maud, R. (1978). The Salish People: The Local Contribution of Charles Hill-Tout. Volume III: The Mainland Halkomelem. Vancouver: Talonbooks. Phillips, R. (2011) Museum Pieces: Toward the Indigenization of Canadian Museums. Montreal and Kingston: McGill-Queen’s University Press. Rowley, S. (2013) “The Reciprocal Research Network: The Development Process.” Museum Anthropology Review 7 (1–2), 22–43. Hennessy, Kate, Schaepe, Dave, Lyons, Natasha, Kadir, Aynur, Muntean, Reese, Pennier, Clarence and Blake, Michael. "Collaborative digital curation and recursive publics: The making of Sq’éwlets: A Stó:lō-Coast Salish Community in the Fraser River Valley." MW18: MW 2018. Published January 19, 2018. Consulted .